Very Clean and informative Template. Effortless. No installation required fonts. Insert your data and send it to print! You – a favorite, .. The perfect way to make the best impression. Strong typographic structure and very easy to use and customise. – The resume have a very .. The template package contains 4 psd files and 4 jpg files for preview. It has 4 color variation. Each color scheme has its own psd file. .. Versus Resume has the main focus on you! With a clean design, clear lines and the right amount of spacing between sections, you can be sure ..
RESUME & COVER LETTER by graphicPILL AVAILABLE IN – Illustrator (.ai, .eps) – Photoshop (.psd) PAPER DIMENSIONS – ..
First impression is everything! Stand out from the crowd with these modern style templates. This set includes a resume, cover letter and reference .. 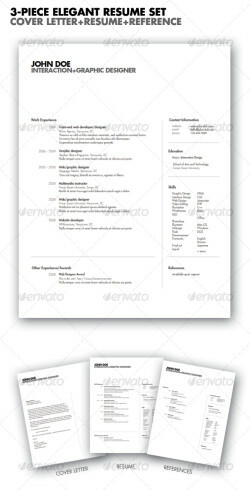 Pro Resume set is a professional clean black and white layout. 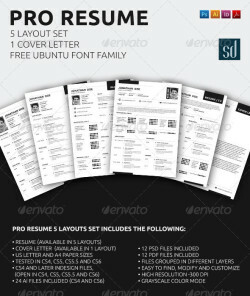 Pro Resume 5 layouts set includes the following: Resume (available in 5 layouts) ..
A sharp and professional project proposal template for creative businesses, created in Adobe InDesign and MS Word, it comes in two paper .. This elegant 3 piece resume set only utilizes grid and typography, the foundations of design, for both readability and legibility. Consists ..